I happened to see Rudy’s photo online and was very concerned about the condition of his legs. I knew if he went to slaughter the chances of him being able to stand for a long trip to a slaughter house in Canada or Mexico was unlikely. He easily could have been mercilessly trampled by panicking horses over the grueling ride of a day or more. 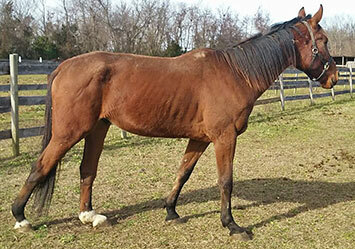 He had once been a Standardbred race horse and then was sold to be a buggy horse. The buggy horses live such hard lives. I didn’t want Rudy to suffer any more; he was only 10 years old. Our Equine Relief Fund made it possible for me to purchase Rudy out of the kill pen and a dear friend Patty, and her family, were able to quarantine him. Patty and I both knew that Rudy’s condition was serious and there were no guarantees we could make him comfortable. Dr. Sandy, Patty’s vet, came right away to evaluate him and we started him on a course of pain medication and antibiotics. The vet thought Rudy had Degenerative Suspensory Ligament Desmitis, commonly called DSLD, which is a systemic disease of the connective tissue of the horse for which there is no cure. She felt we should give Rudy two weeks of treatment and see how he did. Dr. Sandy thought he was just so sweet. Patty and her family showered Rudy with love and attention during that time. Unfortunately, Rudy got worse. He started walking with back pasterns touching the ground and an infection developed in both hind legs. Despite treatment, they didn’t improve. My friend Patty took wonderful care of him as she has so many others we have helped including Margrit from years ago. When Dr. Sandy called me she was in tears because Rudy was such a nice horse, but she knew he was in too much pain and there wasn’t hope for improvement. 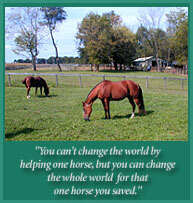 She thanked us for being willing to help a horse like Rudy and give him a humane end. She said it was a pleasure to be able to work with Mylestone, and was so impressed with what we do. She also said rescuing Rudy had given her some joy because Rudy was able to know love and TLC before he passed. She thanked us for saving him. Dr. Sandy even brought an apple for Rudy to have before she humanely euthanized him. This horse touched many people’s lives and I am thankful we could give Rudy what we did. My hope was that Rudy would leave this world knowing he was loved, and that is what happened.